The Gujarat Assembly election results put sudden brakes to the Congress success in the past year that began with the party trouncing the BJP and its allies in Punjab, Uttaranchal and Assam. The BJP’s political journey in 2002 began with depression and ended in high as a single letter “G” turned the sinking fortunes into a bright future. The indefinite curfew, clamped in Dahod town in central Gujarat after outbreak of communal violence triggered by an eve-teasing incident yesterday, was relaxed for six hours today, the police said. In a well-thought-out strategy, the BJP high command has asked its youth wing the Bharatiya Janata Yuva Morcha (BJYM) — to organise an international conference for mobilising international public opinion against international terrorism. 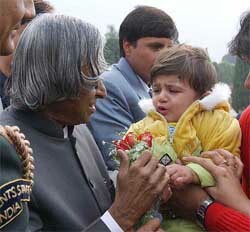 A boy presents a flower to greet President A.P.J. Abdul Kalam on New Year's Day at Rashtrapati Bhavan in New Delhi on Wednesday. The Communist Party of India (CPI) today took exception to the Prime Minister’s musings yesterday, saying that it was “part of a calculated strategy to mislead the people and bring Hindutva in focus”. 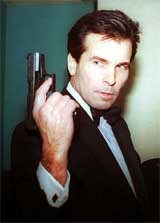 Douglas James, who plays Pierce Brosnan's double in the James Bond movies, made a surprise appearance at Shatranj Napoli in Mumbai last night to celebrate the New Year. Train mishap: sabotage or fault? 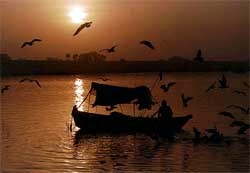 Sunrise at the confluence of the rivers Ganga, Yamuna and Saraswati in Allahabad, Uttar Pradesh, on Wednesday. The confluence, better known as the sangam, is a sacred Hindu pilgrimage centre and is visited by pilgrims and tourists throughout the year. The Congress today criticised Prime Minister Atal Behari Vajpayee for “equating Hindutva with Bharteeyata,” saying that he should have rather used his Goa musings to warn the forces trying to subvert the Constitution. Lured by the charm of this coastal state, Prime Minister Atal Behari Vajpayee has extended his year-end holiday here by a day, officials said. A decade after the controversial purchase which eventually led to her unseating as Chief Minister, AIADMK supremo Jayalalithaa has returned over three acres to the state-owned Tamil Nadu Small Industries Corporation (TANSI). The National Centre for UN CIVPOL Training, set up under the aegis of the Indo-Tibetan Border Police (ITBP) for the pre-deployment selection and training of Indian police officers, has come in for appreciation for its state of the art facilities. The city continues to be on a high security alert in the wake of intelligence reports that two members of the Pakistan-based ‘Lashkar-e-Toiba’ have sneaked into the commercial capital. Information and Broadcasting Minister Sushma Swaraj today asked the Publications Division to bring out reference annual ‘India’ in 11 regional languages. Attorney-General of India Soli Sorabjee today asked the lawyers to avoid an attitude of confrontation on the issue of strike which has been prohibited by the Supreme Court and said going on strike by defying the verdict of apex court would be subversion of the rule of law. Talks about the relaunch of Amrita Bazar Patrika, the country’s oldest newspaper, have brought in new hopes and aspirations in the new year to its 1,000 odd employees, some of whom must have already died or committed suicide while some others are still fighting hard for their bread and butter. Assam Government's announcement of giving OBC status to Muslims has created a controversy in the state. BJP protests against the Madhya Pradesh Government's decision to ban carrying of weapons in religious functions. The Congress carried the momentum of its victories to Jammu and Kashmir where it emerged as the second largest party, virtually decimating the BJP in its stronghold of Jammu. The Congress was in power in 16 states by the end of year and a favourable result in Gujarat, many Congress leaders felt, would have sealed the fate of the BJP for the 2004 Lok Sabha elections. The BJP salvaged some pride by retaining Goa but it was Gujarat where the ruling party gave the Congress its biggest electoral defeat after the last Lok Sabha elections. So shocking was the Gujarat result that senior Congress leaders spent days discussing what went wrong. Gujarat elections, which were described as “the battle for soul of India,” have made the Congress rethink its strategy to take on the BJP in the forthcoming assembly elections and the next Lok Sabha polls. The “soft Hindutva” strategy of the Congress in Gujarat did not pay off as the state Chief Minister, Mr Narendra Modi gave political spin to everything thrown at him by the Congress. The Gujarat elections, held in the aftermath of Godhra carnage and subsequent communal violence, were seen as the battle between “secularism and communalism” by the Congress. The party may now also relook its position on alliances. Though the Congress has had tie-ups with the Left parties in some states, it has not allied with the NCP outside Maharashtra or with the Samajwadi Party. The party did not share seats with the Lok Janshakti Party in Gujarat but its leader Ramvilas Paswan was later requested to join the canvassing arena to add punch to the Congress campaign. Having failed to effectively convey its message in Gujarat and counter the rising ascendancy of “Hindutva forces,” the Congress has been left wondering about ways to prevent losses in Madhya Pradesh, Rajasthan and Delhi which will go to polls in nine months. Aware that more BJP victories would upset all its calculations for the 2004 Lok Sabha elections, the Congress has already begun preparations for states going to poll. The Gujarat debacle has forced the Congress to pull up its socks in Himachal Pradesh, which like Gujarat, is a state held by the BJP. For Sonia Gandhi the major task is of meeting the challenge of “Hindutva forces” and getting back the “feel-good factor” in the party. Godhra, Goa and Gujarat Assembly elections performed that miracle as the 22-year-old political party discovered a new mascot of the party in Chief Minister Narendra Modi who emerged on the political firmament of the party like a shining bright star towards the end of the year. While the year began with crushing defeats in Punjab, Assam and Uttar Pradesh, the tragic train burning incident in which passengers suffered death on February 27 last year sowed the seeds of the revival of the BJP as the party frantically struggled to choose between the Vajpayee path and the Vishwa Hindu Parishad dictated track of “narrow, rigid and extremist” Hindutva. The contours of the revival strategy were unfolded at the two-day National Executive meeting of the party in Panjim, Goa, in April last year where even Prime Minister Atal Behari Vajpayee, probably unwittingly, played a leading role in the political drama as he not only agreed to retain Mr Modi as the Chief Minister against all indications of his removal from the post in the wake of tragic Godhra incident and post-Godhra riots. Here at Panjim, it was decided to remove the then party President K. Jana Krishnamurthi, who was trying to assert in the BJP. Not only that Goa also saw the emergence of Home Minister Lal Krishna Advani, Rural Development Minister M Venkaiah Naidu and Law and Justice Minister Arun Jaitley as the new dictating personalities of the party. Soon after Goa, the party decided to shunt out Mr Krishnamurthi to the Union Council of Ministers against his wishes and annoint Mr Naidu to aggressively lead the party in the changing times. Meanwhile, the Prime Minister dropped not only Mr Naidu and Mr Jaitley from his team of ministers but even agreed to release his colleagues for Rajasthan, Chattisgarh and possibly Madhya Pradesh. While Mr Modi in company of VHP leaders like Praveen Bhai Togadia, Ashok Singhal and Acharya Giriraj Kishore used histrionics and abusive aggression to drive his message across the electorate, Mr Naidu and Mr Jaitley along with Mr Advani and other key figures wove an effective cover for hiding the real intentions. The use of “confusion” as an effective political instrument for furthering the political objectives was further perfected as the central leadership kept the allies in good humour by often denying the statements and blaming the media for misreporting and distorting facts and figures of speech. But the strategy paid rich dividends at the end as Gujarat Assembly election results surprised not only the so called “pseudo secularists” but also the “genuine secularists” of the Sangh parivar. All is well that ends well finally counts and the BJP knew it as it discovered the new road to its political salvation for the time being. The New Year 2003 would determine whether the new strategy was valid for the rest of the country also. The curfew was relaxed from 1 pm to 7 pm, sources said, adding that 39 persons have been detained for yesterday’s violence in which three persons were injured. Most of the shops had upped their shutters despite curfew relaxation, reports from Dahod said. The police lobbed 10 tear gas shells to disperse mobs of both communities that took to streets yesterday after a tribal woman was reportedly teased in a predominantly minority locality on the Court road, sources said. At least 12 houses and six vehicles, including two scooters, one rickshaw, two hand-carts and a cycle, were torched by mobs late last night, Special Inspector-General of Vadodara range Deepak Swaroop said. A kiosk was set afire in the Govindnagar area and 10 fire-fighters were summoned from nearby Jhalod, Devgadh Baria and Santrampur to douse the fire. The conference, being held in early February this year, is being organised to provide a sharp edge to its campaign of Hindutva which is being billed as “cultural nationalism”. An international conference will not only provide a much-needed profile to the BJYM but will also attract more youth to the party. Invitations to over 100 youth organisations and political parties had been despatched, sources said adding that extensive planning had gone behind organising the conference. The conference, which would be held in the Vigyan Bhavan, would be inaugurated by Prime Minister Atal Behari Vajpayee. The valedictory address would be delivered by Deputy Prime Minister L.K. Advani. The idea of organising a conference was mooted with the objective of bringing the focus on the issues of terrorism so that popular attention was diverted from Hindutva, sources said. “The musings of the Prime Minister are part of a calculated strategy to mislead the people and to bring Hindutva, be it hard or soft, in the focus of debate. The Prime Minister wants to avoid debate on socio-economic issues,” the CPI said in a statement released here. 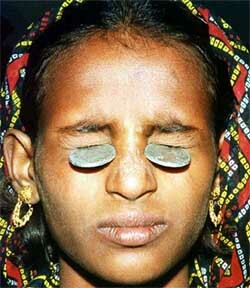 “The Prime Minister as part of his routine trick has created a new debate on secularism even in the context of India. Secularism always means separation of religion. Any other interpretation of secularism is deceptive and is a justification of the hate campaign against minorities,” the CPI said. “His invocations of the names of Tagore and Vivekanand are intended to deceive the people. By doing so he has defended Hindutva as a “swayamsevak”, which he claims he will remain for ever. Even during his holidaying he had no mind to condemn the pogrom that took place in Gujarat, “the statement said. “The Prime Minister’s statement at Panaji yesterday is in sharp contrast to one made soon after he visited Gujarat in the aftermath of the Godhra incident when he described the incident as a blow for India’s image abroad,” former Lok Sabha Speaker Rabi Ray said here. “Statements like those made by Mr Vajpayee yesterday render India’s claims of being more secular vis-a-vis Pakistan and Bangladesh weak,” Mr Ray said in his inaugural address at the Bharat-Pak-Bangladesh Mahasangh Banao conference here. “In fact, after the recent Gujarat elections, which were won on the Hindutva plank, there is an increasing threat to secularism following the resurgence of Communalism. This makes the idea of an India-Pakistan-Bangladesh confederation mooted by the late Dr Ram Manohar Lohia, even more relevant as a means to reduce tensions and bring lasting peace in the sub-continent,” He said. The views were endorsed by other speakers at the conference, which was organised by the Gandhi Jayanti Trust. A resolution passed at the conference called for the formation of a “loose confederation” between the three countries to facilitate interaction between the people of these countries, to resolve their differences and establish lasting peace in the sub-continent. Releasing the resolution Dr M.A. Haleem, an ardent advocate of Indo-Pak unity, said, “The prevailing atmosphere of communalism in both countries is largely a creation of the policies followed by their governments. Among others who spoke at the conference, being attended by writers, journalists and litterateurs from the three countries, were former Judge Ramesh Chandra Srivastava and writer and journalist Shaheed Swarav. Dr Abbas Ali of the Azad Hind Fauj was felicitated at the conference. Congress spokesman Anand Sharma said the Prime Minister should reassure the country that his government would uphold the basic tenets of the Constitution and act against the VHP for allegedly subverting it. “We don’t accept the Prime Minister’s assertion of equating the Hindutva as propounded by the Sangh Parivar with Bharteeyata,” Mr Sharma said. “Instead of indulging in misleading propaganda, Mr Vajpayee should have used his Goa pulpit to warn all of us of the presence in our midst of sinister foreign-funded forces, which are out to subvert the Constitution”, he said. The spokesman said while Bharteeyata and Hindu culture are all inclusive and stood for compassion, love and peace, the Hindutva ideology as propagated by the VHP, the Bajrang Dal and the Sangh Parivar with a political objective was a distortion of these sentiments. “Hindutva is a political maneuver that stoked ill will, violence and hatred among different communities with the single aim of garnering votes,” he said. He criticised Mr Vajpayee for propagating the view that there was no difference between Hindutva and Bharteeyata since both were expressions of the same thought. “This is patently wrong. Bharteeyata is an inclusive world view in which Hindus, Muslims, Christians, Sikhs and believers in all other faiths set aside their theological differences to embrace Indianness,” he said. Stating that the Prime Minister had become “confused”, the Congress spokesman said it was rather unfortunate that despite his mastery over words “which he often demonstrated to side-step the issues and retract statements,” Mr Vajpayee had “overlooked” the sense and meaning of the words Hindutva and Bharteeyata. He said the Sangh Parivar had been speaking in so many voices that even its “most important adherent ” had become confused airing his own “confusion” from his Goa retreat about secularism and Hindutva and India’s age-old tradition of unity and diversity. “The Prime Minister, who was scheduled to return to New Delhi today will now leave tomorrow (Thursday),” an aide said. The land was purchased by two companies in which Jayalalithaa and her close associate Sasikala were partners for Rs 1.68 crore in 1992, when Jayalalithaa was the Chief Minister, sparking charges that it was sold for a lower price. The land was registered again in the name of TANSI by a city sub-registrar office yesterday following a government order, clearing the way for the return of the property, official sources said. In November, city court of Small Causes had lifted attachment of the property on a petition by Sasikala to clear way for restoration of the land purchased by “Jaya Publications” and “Sasi Enterprises” to TANSI. A special court had in 2000 convicted Jayalalithaa and Sasikala for ‘irregularities in the purchases’ and sentenced her to three years’ imprisonment, resulting in her disqualification from contesting the May 2001 Assembly poll, which the AIADMK won with a thumping majority. The centre situated on the ITBP campus at Tigri in South Delhi has state of the art computers, training aids, properly air-conditioned syndicate rooms, seminar rooms and an indoor shooting range. The objective of this training centre is to impart, update and upgrade the knowledge of Indian police officers for peace keeping operations as part of pre-deployment selection and training so that Indian police officers can face the UNSAT confidently and match the international standards of police officers successfully. India is one of the major contributing countries for the UN CIVPOL operations and ranks amongst the top contributing countries in the world. In spite of contributing a large contingent, India does not have standardised arrangements and a centre for screening officers and training them to effectively meet the challenges of the peace-keeping operations befitting the size and status of our country. The task generally allotted to the UN CIVPOL, is to supervise and control the local police for effective maintenance of law and order and protect the human rights and fundamental freedom. Maharashtra Deputy Chief Minister Chhagan Bhujbal, who also holds the Home portfolio, told reporters today that they had information from the Intelligence Bureau about the presence of the terrorists and that strict vigil was being maintained. About the identity of the terrorists, he, however, said they had not received their photographs, and declined to share any other information. Releasing `India 2003’ (English) and `Bharat-2003’ (Hindi) here Ms Swaraj said, “The book enjoys great credibility and is well-known for its authenticity. The book is in great demand and its availability in regional languages will be of great value to people especially the students and research scholars all over the country. Ms Swaraj complimented the Publications Division and the Research and Reference Division on bringing out the reference book on the first day of the year for the first time. Delivering a lecture on the topic “Lawyers right to strike” here, he noted that despite the Supreme Court verdict, the lawyers recently went on a strike when a writ petition on the issue was pending before it. “Don’t they have confidence in courts”, he said hoping that the Bar and the Bench worked in harmony. Mr Sorabjee said if the lawyers went on strike despite the court verdict, it would mean undermining their own position and an “invitation for ridicule and scorn and contempt”. It would also mean subverting the rule of law which is “regrettable”, he said. “Understand the importance and consequences of the action and restrict strike only in the rarest of the rare cases”, he said, adding that the lawyers could not equate themselves with industrial workers or other sections of society. The 134-year-old newspaper, which once played a prominent role in the country’s freedom struggle, went on liquidation in 1986, rendering such a large number of employees jobless. But now after 16 years of silence, there has been a fresh talk of restarting it by Mr O.P. Mal, a businessman who controls the maximum shares, and the United Bank of India, the main banker. The paper, originally a Bengali vernacular, was published in 1886 from a small village of Magura at Jessore in East Pakistan (now Bangladesh) by Tusharkanti Ghose and his father Sisir Kumar Ghose and soon the paper became the cause of anger and wrath of the British government for its active participation in the country’s freedom movement. Its venue of publication was later shifted from Jessore to Bagbazar in Uttar Kolkata (northern part of the city). The paper, which was named after Amritamoyee, one of Tusharkanti’s grandmother, (her sister was Anandamoyee) was soon converted to an English daily in 1876 to escape the draconian Vernacular Act. In its long history of 110 years the Amrita Bazar Patrika like The Tribune (originally published from Lahore ) had played not only an important role in the freedom movement but also played a critical role in independent India. The paper had seen much ups and downs, many vicissitude of fortunes in its long struggle for existence. In 1876 a separate Bengali newspaper, Ananda Bazar, was published by the Ghoses after the name of Anandamoyee but soon the paper died a normal death which Suresh Mozumdar and Prafulla Sarker bought in 1922 and started its publication under their ownership. The employees are happy and so is Amitava Chowdhury, a writer-journalist who had played a vital role as New Editor of Ananda Bazar and Associate Editor of Jugantar for five decades. But like several others, Chowdhury too is a bit skeptical since there had been similar move several times in the past but nothing fruitful emerged.